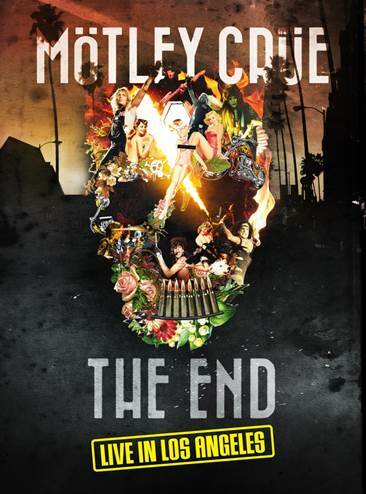 On 4 November 2016, Eagle Rock Entertainment will release “The End – Live In Los Angeles” by Mötley Crüe on DVD, Blu-ray, DVD+2CD, DVD + 2LP, Deluxe Edition and Digital Video [Cat Nos. EREDV1254, ERBRD5303, EAGDV069, ERDVLP097, EREDV1261 and EVD1365 respectively]. This show captures the madness and the majesty of the final Mötley Crüe live performance and is packed with classics like Girls, Girls, Girls, Dr Feelgood, Looks That Kill, Smokin’ In The Boys Room, Saints Of Los Angeles, Home Sweet Home, Live Wire, Primal Scream and more! Filmed in high definition and simultaneously released on DVD, Blu-ray, DVD+CD set, DVD+2LP set and Deluxe Edition. The Deluxe Edition contains the DVD, Blu-ray and CD in a 60 page hardback book. On the 31st December 2015 Mötley Crüe took to the stage of the Staples Center in their hometown of Los Angeles for their last ever live performance. It was the culmination of their Final Tour which had started in July 2014 and travelled around the world taking in North and South America, Japan, Australia and New Zealand, Europe and the Middle East. The show features, of course, the Line-Up of Mötley Crüe 1981-2015: Vince Neil (vocals), Nikki Sixx (bass), Tommy Lee (drums), Mick Mars (guitars). The band had signed a legally binding “cessation of touring” agreement that prevented them touring as Mötley Crüe beyond the end of 2015 and so this concert truly was “The End”. Known for their over-the-top production, Mötley Crüe did not disappoint for their last show ever on New Year’s Eve: from massive, cutting-edge pyro, including Nikki Sixx’s bass guitar spitting fire over 30ft. into the air, and Tommy Lee’s “Crüecifly” drum roller coaster, amongst many other spectacular elements. Lead singer, Vince Neil, delivered an emotional, “thank you” speech to the audience, while the band supplied next-level, high-octane fueled energy, ringing in the New Year on stage with thousands of balloons raining down on the crowd. The grand finale of the show included a blow-out performance of their hit single, “Kickstart My Heart” with Nikki Sixx and Vince Neil floating above the audience in far-reaching “cherry-pickers.” Leaving fans in tears, the show concluded with an emotional encore rendition of “Home Sweet Home” from the second stage riser in the center of the audience. Bonus Features include interviews with the whole band, a feature on Nikki’s Flamethrower Bass and an exclusive tour of Tommy’s Drum Rig. “The End – Live In Los Angeles” captures an incredible moment of rock and roll history in all its glory. They may be gone but they’ll never be forgotten – R.I.P Mötley Crüe.